The Data Protection Acts 1988 and 2003 and the EU General Data Protection Regulation (GDPR) helps protect patients by providing laws to ensure adherence to the principles of good information governance. Information governance is the set of standards we must follow in handling personal healthcare records. Good information governance means that all personal health information is handled legally, securely, efficiently and effectively in order to deliver the best possible care to people who use our services. It also includes sharing of relevant personal health information with our service users where appropriate. No. If you wish to receive safe and appropriate care and treatment at any of our hospitals we must maintain an accurate record of relevant information about you. However, if you have any concerns about providing information or how we share this information with other healthcare providers, please discuss this with our staff so that you fully understand the potential impact on your care or treatment. Other hospitals/institutions that are actively involved in your care and treatment. National Health Databases such as the National Cancer Registry. When we do share information with other organisations involved in your care, we do so under a formal agreement about how it will be used and kept confidential. This can be explained further on admission. We will not disclose your information to any other third parties without your permission unless there are exceptional circumstances, such as if the health and safety of others is at risk or if the law requires us to pass on information. Receive payment from your health insurance provider. Teach and train our staff . Wherever possible we use information that would not identify you personally (anonymous information) but we will let you know if we are using your data for this purpose. Research has a vital role to play in the development of healthcare and health service delivery. The Bon Secours are teaching hospitals and we support and promote research activity within the hospital. Our Research Ethics Committee must approve research before it takes place. If we wish to use your personal information for research then we will ask you for permission first. You will not be identified in any published results without your agreement. How do I keep my records confidential? Yes. You have the right to access any information we hold about you. The GDPR and Data Protection Act allow you to find what information is held about you. Patients can request their own personal health records or the records of a dependant by contacting us directly. We encourage requesters to contact the relevant hospital Department to ensure that the correct information is given and to narrow the field of enquiry. Contact details are shown in the table below. For your convenience and in the interests of processing your request more efficiently we have provided a form that you can complete and send to the relevant hospital as per the table above. This is available using a link at the bottom of this page. If you wish to discuss your application for deceased patient records, please contact the relevant DPR directly using contact information above. Parental consent will be required to process the personal data of children under the age of 16. Implied : “Can I take your blood pressure?” Patient holds arm up. Written: Signing a consent form for an operation. We will always request our patients to do this. The procedure cannot take place without a written consent. For children under the age of 16 years, a parent or legal guardian can consent to the treatment of the child. Minors who have reached 16 years of age can give consent to any surgical, medical or dental treatment as if they had reached adult age. It is not necessary to obtain any consent from his or her parent or guardian; however it is good practice to involve the parent or guardian if the 16 or 17 year old wishes. 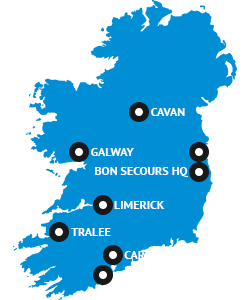 For further information or queries about your data and your data protection rights, please contact the Data Protection Officer, Bon Secours Health System, Bon Secours Group Offices, 7 Riverwalk, Citywest, Dublin 24, D24 H2CE, phone: 01 685 4474, email: dpo@bonsecours.ie.